No doubt I’ve earned Bike Snob NYC‘s Seal of Disapproval, but I’ve acquired a fixed-gear bike, a Specialized Langster Boston. I’ve desired a fixed-gear for some time and the deal was too good to turn down. It’s been a long time coming. Two decades or so ago, I wandered into what was then Hampton Roads’ cycling mecca – the Colley Avenue Bike Shop – looking for a road bike. For some reason I was drawn to a celeste green creation with no brakes, no derailleur and no gears. They happily planted me atop the Bianchi track bike and I wobbled down 25th Street a block and came back up 26th. It was an awkward ride, but I was intrigued. Still there was no track anywhere near Hampton Roads, it seemed unsafe for the road and highly impractical for college in Charlottesville. So I purchased a trick little Centurion with a SunTour gruppo. The Centurion got good use. I even raced once or twice. I worked as a bike courier in D.C. in the summer of 1986. That’s another story, but even then a handful of couriers rode fixies and swore by them. Me? I liked gears especially for the climbs up Capitol Hill, Wisconsin Avenue and out of Georgetown on the bike path along I-66 at the end of the day. Still, an appreciation for fixed-gear bikes grew. Those riders were strong. Plus there was something about the bikes’ simplicity that appealed to me. A burglar stole the Centurion in 1992 from my apartment in Charlotte, N.C., where I worked first after grad school. I didn’t really replace it until about six years ago when I bought a close-out Schwinn Fastback and rediscovered cycling when I turned 35. 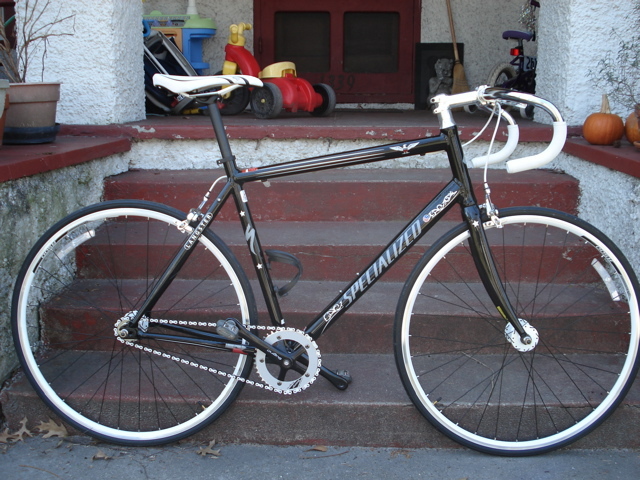 I’ve since bought a mountain bike, a cyclocross bike and replaced the Schwinn after the frame cracked. Returning to cycling, I’ve discovered there are many subcultures in the wider bike culture: road racers, tourers, tandemites, triathletes and mountain bikers, which in turn has even more subcultures – racers, gravity boys, singlespeeders … the list goes on. Then there’s the urban fixie culture with young trendoids in skinny jeans riding helmetless and brakeless through cities nationwide. I’ll never eschew a helmet and can’t imagine not having at least a front brake for those emergency situations. But it reminded me of my desire to ride fixed. Who’s to argue with a luminary like Sheldon. So I join the fixed-gear nation, a little late to the party, but loving it so far anyway. I’ve only ridden my Langster twice to work. The bike is a little too fashion forward for my taste. I like the Boston-themed black paint with white scroll work styled from the USS Constitution, but everything else is white too – the saddle, bar grips, cable housing, rims, hubs and even the chain. It seems a little much. I need to adjust the gearing too. It’s 42×16, which is fine for cruising around, but won’t fly for training. I’m thinking a 14 rear cog. And if I do race it (which I plan to), I’ll need a 48 or larger ring up front or face being spun off the back. But mostly I plan to just enjoy the ride, even if I’ve become yet another of Bike Snob NYC’s signs of the apocalypse. What’s my old Humber Sport? Is that a fixed gear, or so old it doesn’t even fit into these categories? She’s still a “peach”. Sometime I’d like to bring her down and ride the bike path from West Ghent to downtown with you all. WHO CARES ANYWAYS WHAT A BIKE SNOB THINKS, ????????????????????????? Welcome to the wonderful world of fixies. You ought to drag that thing down to Frogs on a Saturday morning for one of our track bike training rides… it’s a good time! I built that the other night and thought I would put more reflectors on it cause I know how dangerous you are, but I thought the white was enough.